Yet another golf course closed on the Grand Strand of Myrtle Beach, but I don’t think many folks will be all that upset about it. Brick Landing Golf Club, in Ocean Isle, North Carolina, developed a fairly wretched reputation among Myrtle Beach’s vacationing golfers not long after it opened up in 1988. The Conlon bunch that I play with each spring had an unusually uniform reaction to playing this course the one time we did. If I recall correctly, as soon as the round finished, we met together in the parking lot and quickly agreed that we would never go back there. I’ve heard similar comments from Cape Region golfers who also tried the course—once. There was a lot not to like about the place, including the misleading advertising about how the course ran along the Intracoastal Waterway. Two of its holes were in the vicinity of the passage, but that was it, and they weren’t particularly well designed. Several of the other holes also left something to be desired. For example, one extremely short par 3 was mislabeled about its actual yardage, leading many of us to fly our tee shots over the green with the greatest of ease. This course … was always one of the top two or three contenders for “The Worst Golf Course in the Myrtle Beach Area,” and has, since 2000, been a fixture in the MBGA Basement. We could have also listed it in our “Golf Jokes” section, and it would fit perfectly. It was originally designed by the long forgotten real-estate developer of Brick Landing, and it certainly reflects his obvious incompetence…. Good riddance to old rubbish! A July 10, 2010 local newspaper reported that the property had changed hands several times in the past decade, which is rarely a good sign. A judge signed a foreclosure order on July 9, regarding a past due loan for 5 million dollars. With interest and other charges, that amount had ballooned to over 6 million. The only real mystery about this situation is how Brick Landing managed to stay open as long as it did, considering all of its dubious charms. At the peak of the boom times in golf course construction in Myrtle Beach, there were over 120 golf courses spread over the 60-mile stretch. Over 20 of these courses are now gone. Some were converted to condominium developments, and others became shopping centers. More recently, the closed golf courses have simply been allowed to go back to the wild, as the general commercial real estate slump has hit the Carolina coast with a vengeance. 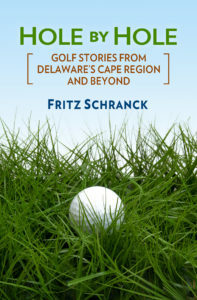 The Cape Region never went through Myrtle’s irrationally exuberant experiment with golf course development, thankfully. While all of the local courses would be happy to have more rounds, none of the public layouts appear to be going through the kinds of struggles that lead to so many closures down South. A rules decision highlighted recently on the United States Golf Association website reminds golfers that intent is a significant part of the game. Just after whiffing a swing and missing the golf ball, a golfer brings his club back and manages to hit the ball backwards and out of bounds. The backward swing was not a stroke. A stroke is the forward movement of the club made with the intention of striking at and moving the ball…. In addition to counting the missed stroke, the player incurs a penalty stroke for moving his ball with the backward swing …, and the ball must be replaced [to the spot it occupied before the player hit it]. There’s no out-of-bounds issue. Even so, two more strokes have been added to the score, and the ball officially has not moved an inch.